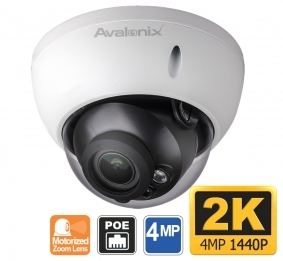 This 4 Megapixel Impact Resistant IP Dome Camera is a feature rich camera at a very affordable price. In addition to it very high 2K resolution, it has a motorized varifocal lens of 2.7-12mm that allows the user to control the lens from anywhere. Once you mount the camera and set it in the direction you'd like it to look at, you can zoom in or out from the NVR, from a computer, or from your smartphone or tablet. At the widest setting of 2.7mm, you can expect to have a 100 degree view. When you are zoomed in all the way at the 12mm zoom length, you will have a 35 degree view and be able to discern fine detail up to 70ft away. The 2K resolution video provided by this security camera will blow away anything you've seen before. The on-board color 4MP CMOS sensor will provide a 2688 x 1520 pixels picture that allows for digital zoom even after video has been recorded. This increases the likelihood that you will be able to capture faces and relevant detail in the event of a break-in that will lead to swift prosecution of the criminals. Let's not forget this dome security camera is vandal and impact resistant and has infrared night vision. You can expect the camera to see in complete darkness up to 100ft away. 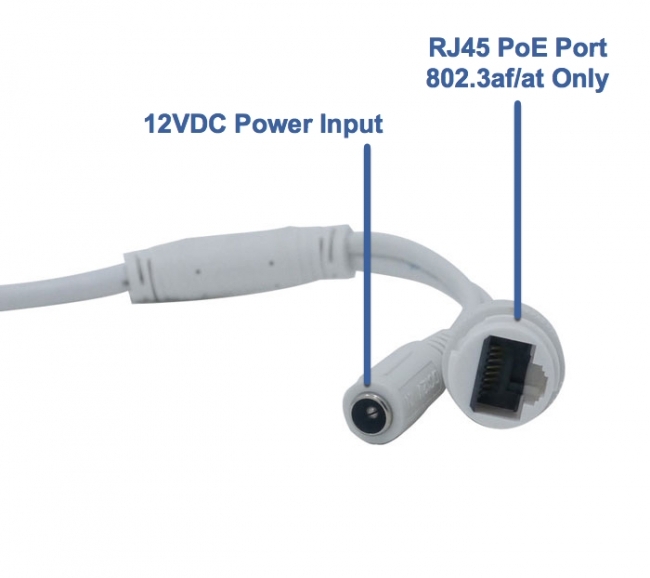 For powering the camera, be sure to use one of our PoE switches, PoE enabled NVRs, or a 12VDC CCTV power supply. To record video we recommend using one of our PoE NVR which provide plug & play compatibility with this camera. Is it possible of this camera on the screen to indicate the orientation direction (e.g. West, East, North, South) and the degrees of deviation from the orion? No that is not possible. Also this IP security camera is not a PTZ camera that allows for rotation and zoom. This Dome Camera only has a motorized zoom varifocal lens, and no rotation control.